← Lost in Cyberspace! Or at Least on the Arizona 101 Loop. I would just like to say that the volunteers from the Warren Astronomical Society are simply the best! Two different groups collectively froze their posteriors off running Lunar Eclipse outreach events at Stargate Observatory and assisting Cranbrook Institute of Science with their event, which saw several hundred guests! As Venus moves down towards the horizon, the several weeks-long conjunction of Venus, Jupiter and the star Antares in the southeastern predawn sky is slowly spreading apart. Conjunction of Venus, Jupiter and the star Antares is spreading out the southeastern predawn sky. Credit: Stellarium / Bob Trembley. The Moon reappears in the southwestern sky as a waxing crescent later in the week - keep an eye out for earthshine! Thin crescent Moon on the southwestern horizon at sunset on Feb. 7, 2019. Credit: Stellarium / Bob Trembley. The Moon, Mars and Uranus high in the southwestern sky after sunset on Feb. 10, 2019. Credit: Stellarium / Bob Trembley. 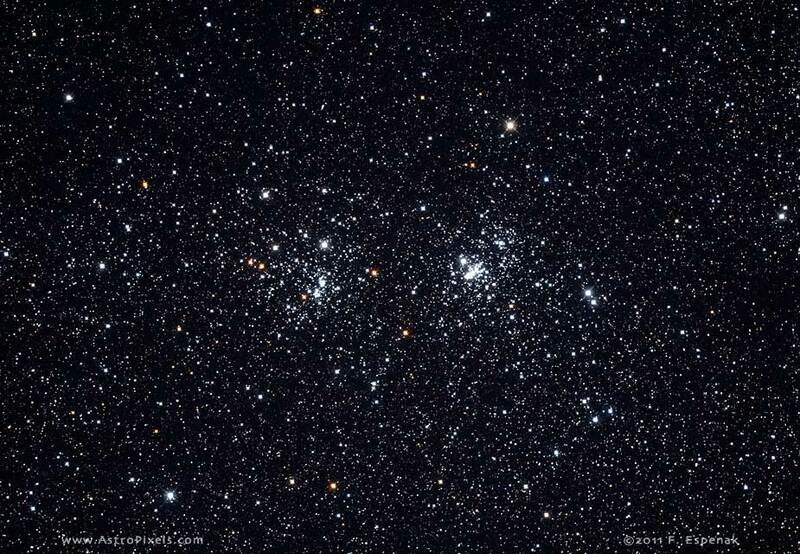 The Double Cluster and the constellation Cassiopeia appear to the northwest sky early in the morning. Cassiopeia and the Double Cluster in the northwestern sky on Feb. 5, 2019 at 1:00 AM. Red arrow shows how to "star-hop" from Cassiopeia to the Double Cluster. Credit: Stellarium / Paint.Net / Bob Trembley. In suburban skies, you can just barely make out the Double Cluster; from dark sky locations, the cluster is clearly visible to the naked eye. I remember seeing the Double Cluster from the shores of Lake Superior in 2000 - it was so bright and clear, it was startling! The Moon is just past new; later this week, it will be a waxing crescent, visible toward the southwest in early evening. The Moon should be a great observing target starting this weekend. The Moon from Feb. 5-11, 2019. Visualizations by Ernie Wright. The Sun has been spot-free for 5 days; large coronal holes appear at both northern and southern poles. 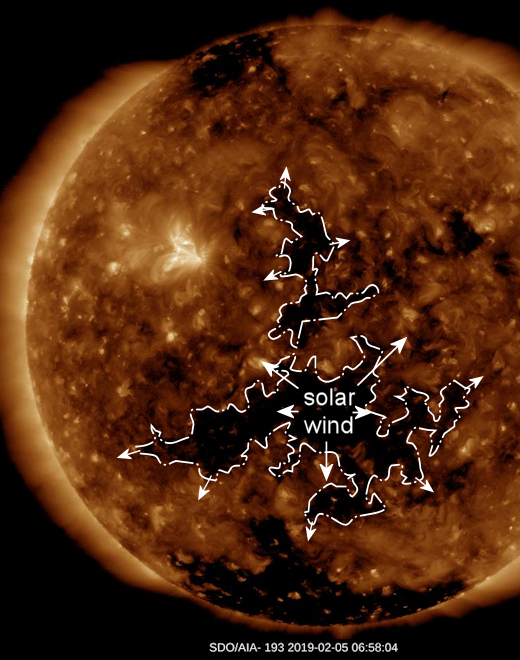 SpaceWeather.com says: "A southern hole in the sun's atmosphere is spewing solar wind toward Earth. G1-class geomagnetic storms are possible when the gaseous material arrives on Feb. 7th or (more likely) 8th. Arctic sky watchers should be alert for auroras." Lots of prominence activity over the last couple days - look at the huge jumping loop in the lower left! The solar wind speed is 363.9 km/sec (⭡), with a density of 4.3 protons/cm3 (⭣). You can view the Sun in near real-time, in multiple frequencies here: SDO-The Sun Now. You can create your own time-lapse movies of the Sun here: AIA/HMI Browse Data. You can browse all the SDO images of the Sun from 2010 to the present here: Browse SDO archive. On Jan. 28, 2019, the NASA All Sky Fireball Network reported 9 fireballs. We Got Hit! Bolide Explodes over Cuba - Meteorites Found! You can bet that professional meteorite hunters were on their way almost immediately... oh I SO want a meteorite from this fall! This is the position of the planets and a couple spacecraft in the solar system; Mars continues to pull away from MarCO A & B, and the Parker Solar Probe is falling back in-system. Position of the planets in the inner solar system, Feb. 5, 2019. Credit: NASA Eyes on the Solar System / Bob Trembley. Position of the planets in the middle solar system, Feb. 5, 2019. Credit: NASA Eyes on the Solar System / Bob Trembley. Position of the planets in the outer solar system, Feb. 5, 2019. Credit: NASA Eyes on the Solar System / Bob Trembley. Highlight on Sedna – in the extreme outer solar system, Feb. 5, 2019. Sedna takes 10,500 years to complete one orbit. Inset image is an artistic representation. Credit: NASA Eyes on the Solar System / Bob Trembley. OSIRIS-REx orbiting Bennu Feb. 5, 2019.Credit: NASA Eyes on the Solar System / Bob Trembley. Using thousands of #Landsat images we use >3 decades of fire and harvest info to observe the protective function of parks. NASA Eyes on the Solar System: an immersive 3D solar system and space mission simulator - free for the PC /MAC. I maintain the unofficial NASA Eyes Facebook page. Stellarium: a free open source planetarium app for PC/MAC/Linux. It's a great tool for planning observing sessions. July 20, 2019 is the 50th Anniversary of the Apollo 11 landing on the Moon. Bob is a lifelong amateur astronomer, and the 2019 outreach officer for the Warren Astronomical Society, and a volunteer NASA/JPL Solar System Ambassador. Bob does a lot of astronomy outreach - he lectures about astronomy and space science, and sets up his telescopes at schools, planetariums, conventions, and other venues. From 2014-2016, he was the editor of the Warren Astronomical Society's newsletter.